With the wonderful RHS Chelsea flower show just around the corner we thought it would be apt to share some park home garden ideas to inspire those green fingered park home owners among you! Park homes have limited outdoor space but this doesn’t mean that you can’t have a garden to be proud of, and to relax and unwind in. Here’s a few ideas we’ve accumulated from working on park home sites over the years. 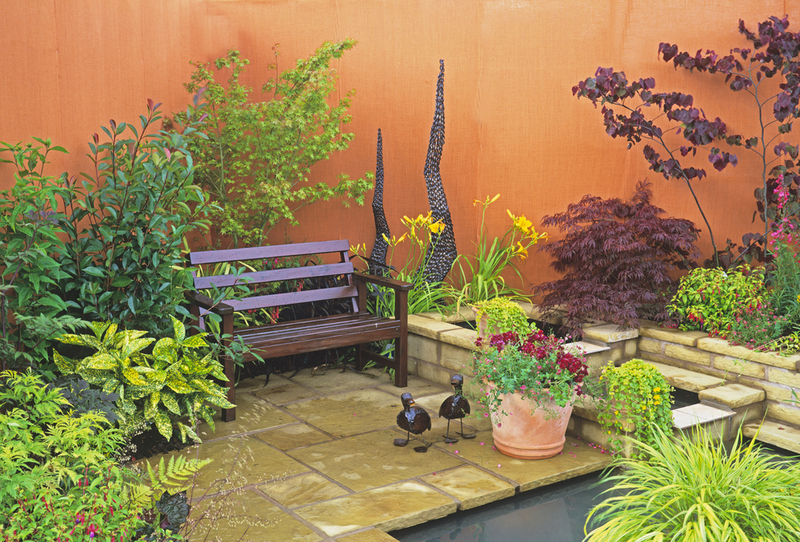 Create a theme – Japanese or beach themes lend them selves extremely well to smaller gardens. The addition of small structured trees like Japanese Maples, ever green shrubs like Box Hedging, pebbles or gravel, rope and a few feature plants can make for the wow factor garden. The benefit of this style of plating is that they have year round interest and require little maintenance if planned effectively. Many cottage style gardens have plants that die back leaving a bare bare border over the winter, not to mention the work that comes with digging over the borders and replanting each year! Use pots for interest – pots are easy to maintain, easy to transport (if they’re not too big) and provide an instant lift to any park home garden. If you don’t have room for beds, a cluster of pots lined up along your path or decking can brighten and lift it instantly. You could choose annuals for a splash of colour, or choose evergreens that may require a light prune and feed once or twice a year. Just remember pots freeze faster than the ground so choose hardy plants for year round interest. Raised beds – weather you choose sleepers, bricks or logs, raised beds create a new dimension to park home gardens. They add height and interest and not only that are easier on your back! Simply top up the soil each year with a fertiliser or compost and dig it over with a trowel to keep it fresh. Planting aubretia and other small trailing plants creates a beautiful effect as they tumble over the edge with bursts of colour. Garden ornaments – you only need to pop to your local garden centre and you’ll find an array of garden ornaments to suit all tastes and budgets. From bird baths, water features, novelty planters, statues, and lets’s not forget the classic gnomes, who doesn’t love a gnome?! A particular favourite of ours is a step ladder, folded out with an array of pots lined up. This adds, height and colour and uses only a small amount of floor space. Create a division – screens strategically placed in your garden can create the illusion of space as they lead your eye down to what lies beyond. Not only that, they can act as a barrier and give some some often much needed privacy from neighbours which are usually cited in close proximity. Screen ideas include: hedging, climbing plants, fencing, metal screens, stacked pallets, willow/bamboo/trellis panels. Wall planters – easy to come across these can take many forms. From ceramic to wood or even plastic. Often they are easy to hang and they provide a splash of colour to a park home garden without taking up floor space. You can situate them for ease of watering and they look stunning with seasonal bedding plants. Petunia, Viola and Lobelias can be picked up for very little cost and will flower throughout the summer into the Autumn provided they are watered, fed and dead headed regularly. Bear in mind that you may need permission from the site manager to make changes to your garden if it involves major landscaping and the addition of new fencing. We hope we have given you some inspiration and if any of you make it to the flower show you can email us photos to info@blackboxhomes.co.uk and we will share your pictures on social media and in our monthly newsletter! If you are looking for more ideas you will find 40 fantastic photo’s that will inspire you here.